The unit sleeps four comfortably with 1 king and 2 twins (no sleeper sofa). 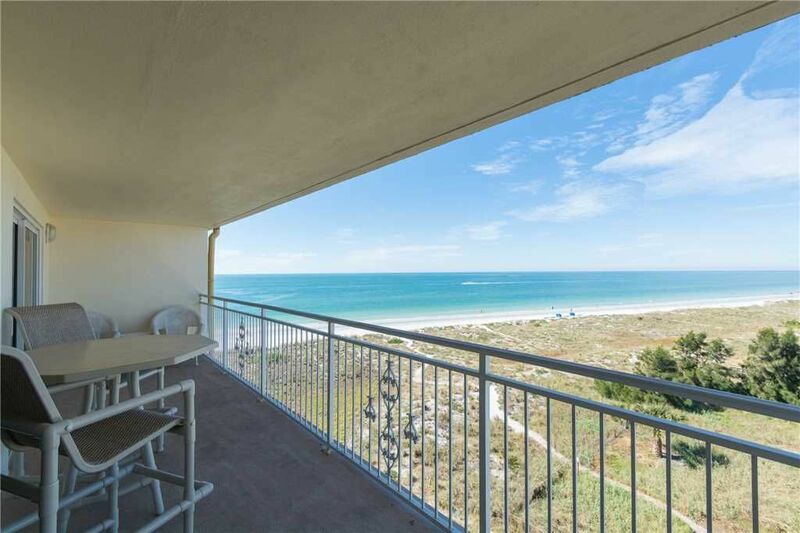 Completely renovated and upgraded unit with new Italian tile throughout, premium granite countertops, custom cabinetry, plantation shutters and a ‘beachy style’ decor. Free WIFI, with unlimited long distance throughout the U.S. and CANADA. TV's in both bedrooms and a 37" flat-screen in the living room, CD and DVD players. The non-smoking unit has its own washer and dryer, with a designated parking space, and there are ample BBQ facilities provided. Beautiful view had us wishing we owned the place. Office and maintenance staff were personable and efficient. Condo was clean and spacious enough for four with plenty of cookware and dishes. Minor criticisms were NO beach towels or chairs, no coffee and supplies for at least first morning, no spices or oils for cooking. If you wish to cook any, you will need to purchase everything you need and then throw it out when you leave. I realize some people prefer it that way, though. I would definitely return. Breathtaking views, incredible sunsets & the location was superb. Very impressed with Maderia Notre grounds. Very well kept & clean. The two sets of keys provided were super convenient to get around and it was nice knowing only those staying there had access. As mentioned by another guest the living room furniture needs to be replaced (owner indicated it would be) as well as the King mattress. This condo could benefit from a thorough cleaning. If a million dollar view is what you're looking for, this is the place. View was amazing! The condo needs a thorough cleaning. The furniture in the family room needs to be replaced. All else was good. More furniture on the deck would be nice. Only had three chairs. Loved this condo. Nicely updated. Beach chairs and fan in closet. Ceiling fans in master, living room and dining room. Great view. We would rent this unit again. Could not get into WiFi with either password so if you need WiFi make sure and get current password. Master bed was a little too firm but still ok.
My family and I always spend a week in the fall in Madiera Beach....even though we live in Florida, we love this area. Good food and plenty of things to do. This year it was in this unit #515...nice and clean with great views with wonderful sunsets.